Be sure to read to the end for some great Dollar Bill fun! The black seal with the big letter in the middle signifies the Federal Reserve bank that placed the order for the bill. A = Boston, B = New York City, C = Philadelphia, D = Cleveland, E = Richmond, Va., F = Atlanta, G = Chicago, H = St. Louis, I = Minneapolis, J = Kansas City, K = Dallas, L = San Francisco. The letter also corresponds to the black number that is repeated four times on the face of the bill. For example, if you have a bill from Dallas with the letter K, then the number on the bill will be 11 because K is the eleventh letter in the alphabet. Why is there an unfinished pyramid with a glowing eye? Thomson explained the sturdy pyramid as a symbol of "strength and duration". He did not explain its unfinished state, but many believe it signified that our nation remained unfinished. The pyramid also stops at 13 steps, the number of the original colonies. 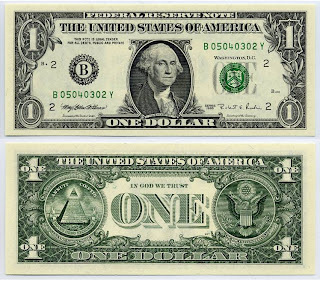 The "Eye of Providence" is a visual representation of the words Annuit Coeptis, and reinforces the founders' notion that God looked upon the endeavor of the new nation with favor. Many theorists mistakenly believe the symbolism of the eye is related to the Freemasons (a secret society whose members believed they were under the careful scrutiny of God), but the symbolism of the glowing eye is far older than any Freemason thinking. Scholars have traced versions of the symbol as far back as the ancient Egyptians. And finally... Origami with a dollar bill! What do you want to learn to make? Here are some awesome things you can learn to make out of dollar bills with a little help from how-to videos.